Now’s the time of year to be on the lookout for a small 1 1/2-in. green caterpillar with white racing stripes and a voracious appetite each spring in North America. IDENTIFICATION — Now’s the time of year to be on the lookout for a small 1 1/2-in. green caterpillar with white racing stripes and a voracious appetite each spring in North America. The cabbage looper can eat three times its body weight every day! And with two to seven generations each year, depending on the length of your growing season, that’s a lot of plant damage. 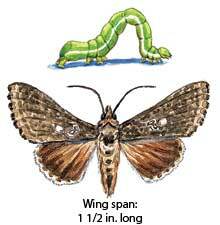 The moth has mottled brown wings with a single silver spot in the center and most often lays a single pale yellow to green egg on a leaf. But clusters of six or seven eggs aren’t uncommon. Cabbage looper’s favorite egg hosts are cruciferous vegetables, such as cabbage, turnips, kale and others, but it’s not picky. About three days after the egg is laid, a caterpillar emerges and starts eating. DAMAGE — Yes, a cabbage looper loves to eat cabbage, but it also munches on broccoli, cauliflower, potatoes, lettuce, tomatoes and cucumbers. Ornamental plants, such as mums, carnations, snapdragons, geraniums and hollyhocks, are also on the menu. Avoiding the veins of the leaves, the cabbage looper eats irregular holes and can defoliate a plant in no time. This can stunt growth or even kill the plant. Be sure to check the centers of broccoli and other plants, as a cabbage looper will sometimes bore its way into the heads. CONTROL — You can hand pick any caterpillars that you find. Or encourage predatory wasps and ground beetles to live in your garden by avoiding insecticides and leaving leaf debris or mulch around for hiding places. In turn, they’ll do you the favor of eating these hungry caterpillars. For serious problems, try a spray product containing neem. This organic pesticide stops the caterpillar from eating and disrupts its growth so much the insect dies.